Obama likes Metallica more then Megadeth - Miata Turbo Forum - Boost cars, acquire cats. Sheesh, it sure is a bad time to be Dave Mustaine. After declaring during a recent interview that “I know [President Barack Obama] was born somewhere else than America,” the Megadeth main man first got an earful from GWAR’s Oderus Urungus; now President Obama himself has spoken out against Mustaine, making some pretty damning accusations of his own. It’s no secret that Obama is a metalhead; a couple of years ago, he weighed in on the state of The Dillinger Escape Plan, too. Still, the Prez so rarely talks about metal in public, it’s always still kind of surprising when he does. Ouch. 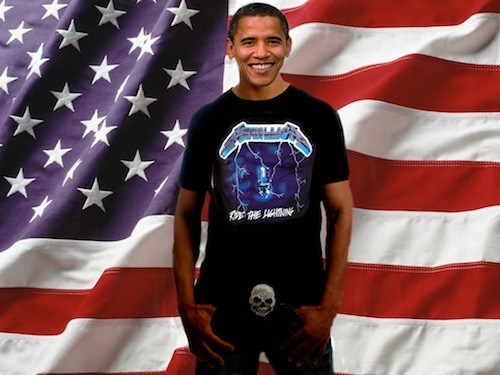 I guess the good news is, Obama probably has James Hetfield’s vote now?